Narrative Style – A series of third person perspectives from different characters’ points of view. 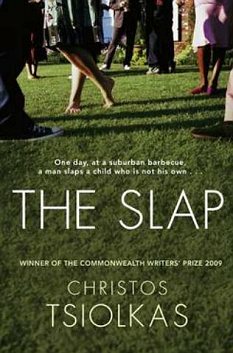 Synopsis: At a barbecue in suburban Australia, a young child is out of control. While others look on in horror, a man who is not his parent slaps the child. The repercussions of this act ripple through the lives of all present that day. Time on Shelf: Only about three years. I meant to read it before it was on TV but then I only managed to watch the first episode (not because it wasn’t good but because I was too busy and/or hopeless) and the urgency fell away. I was quite glad not to have watched it as I really enjoyed not knowing what would happen. Before reading this, I was interested to see how the issue of child discipline would be handled. This is a emotive issue. If you are seen to disagree with modern parenting methods then you are perceived as some sort of barbarian. But sometimes it does seem that children are being done no favours by parenting methods that give them a choice about everything but neglect to teach them that sometimes they won’t get their own way. Tsiolkas handles these issues successfully due to the method of giving each person a chapter and opinion. He shows the multi-faceted nature of the issue at hand. There is not doubt that Hugo is a little monster, still being breastfed at almost four, refusing to play nice and told by his mother that he is the most important person in the universe. Actually, Rosie, his mother was one of the less convincing characters, she was too cliched an earth mother for me and I found her chapter one of the least fun to read. However, this may be due to the distance between myself and this sort of women. She was the sort of person I would never be friends with. Harry, the person who slapped Hugo was suitably horrible – racist, sexist, violent. After all, even if you might think that child could do with a slap, there aren’t many of us who would put that into action. Even so, I was pleased that the court decision went his way. You shouldn’t slap someone else’s child but surely you don’t need to take it to the police either. I enjoyed reading the different viewpoints and trying to understand how different characters came to their decisions about the incident. The story unfolded cleverly and there was always reason to keep reading. The ending pulled together most of the narrative threads and was largely satisfying. The only thing I might have liked was more from the early characters as hints are dropped about them but you don’t actually get to see how they have changed. When I rated this on Goodreads, I was surprised by the number of negative reviews. There is s something a little soap opera like about this but I don’t think this is necessarily a bad thing. The issues raised – like those in a soap opera – are pertinent to everyday life. I enjoyed this and will certainly be reading more of TSiolkas’ books.